We were all ecstatic about the successful Pinakbet in a Palayok effort, and the fire was still going, so the crew decided to boil several semi-ripe saba bananas in what must be one of the simplest yet most satisfying eats this side of the Pacific. 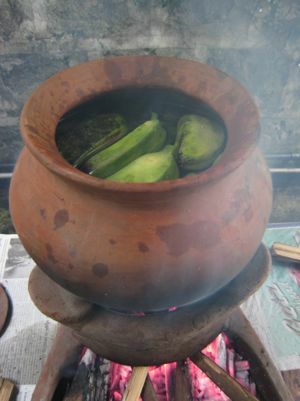 In a large palayok, add water about halfway up and turn up the fire. Before the water gets to the boiling point, add several saba bananas and then cover and wait patiently for it to come to a boil, ours took near 20+ minutes. Then when the bananas are soft and cooked, remove them from the water, peel them and dunk them into a bowl with generous amounts of fish bagoong, vinegar and cut up siling labuyo. Excellent! The starchy sweetish banana with the salty, sour and spicy dipping sauce was wonderful. I’m not sure the palayok did anything for the overall flavor of this dish, but the experience of fanning the flames, the smoke, the long boil, the anticipation of peeling open a banana boiled over an open flame and the classic mingling of bagoong, suka and sili are simple Pinoy comfort food at its best! I never grow tired of eating sweet boiled saba. Always brings back childhood memories. What a combination we have here MM; we’ve got the sweet from the saba, the salty from the bagoong, the sourness from the vinegar and the spicyness from the sili! WOW!!! I have to ask you, is this combination something from the Ilocos region too, to dip the saba in the mixture of bagoong, vinegar and sili; or is it something that you or your crew thought about of doing, sort of experimenting? thank you for this post,mm, it brought childhood memories from many summers ago when as kids, we would go up the mountains around our small baranggay in baguio and forage for anything we can snack on. from neighbors gardens we pick bananas, camote, pinya, fruits etc and we would play lutoluto-an and we thought it silly dipping our loot in the bagoong, sukang iloko and sili combination. those were some priceless days. You took further step up in preparing our saba bananas in its best eating mode boiling them in our unassuming cooking vessel palayok – they are the workhorse of our bananas. I never had the opportunity eating boiled saba dunk in vinegar, fish bagoong and sili dipping sauce. With or without the dipping sauce they are good. How did you serve this like an appetizer to wet the appetite, serve in between meals or I would not say dessert since the vinegar and bagoong are in there? Iâ€™m much amused with your palayok cooking marathon as it brings back a lot of fond memories of my grandmaâ€™s kitchen. She had pugon though with four burners fired up with chopped woods and the ever present of the pipe pole we blew our breath out with our full lungs to flare up the burning flame. Sounds like the filming of Three Little Pigs and The Big Bad Wolf huff, puff and blow! your dipping sauce is interesting…i’ve never tried it with saba. 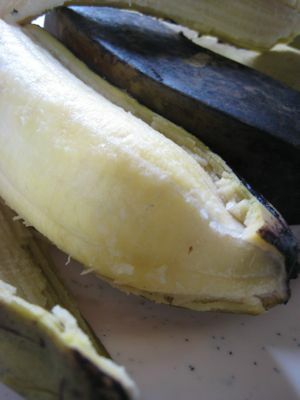 Have you ever tried eating ripe saging na saba, uncooked? i noticed this predilection for the humble saba-bagoong combination among the cebuanos and boholanos in davao. childhood spent in the province meant a lot of post siesta merienda consisting of boiled saba, kamote and whatnot. this is a first for me…looks interesting enough to try. have to find a good fish bagoong to make this work. thanks! btw, what kind of bagoong should i use? Tip when boiling saba: immediately after the saba are cooked, drain the boiling water from the palayok. Remove the burning wood from the kalan and leave only the some embers. Cover and return palayok to the kalan to make “in-in” the saba. After about 5-10 minutes, removed the saba from the palayok and serve it piping hot! Boiled saba done this way taste a lot better than that which is served immediately after plucking out of the boiling water. Help: Does anyone knows the english equivalent for “in-in”? Right timing! We have saging na saba today. Its better boiled if you have high cholesterol than cooking it with sugar. Same with egg, it is better boiled. try also grilling the saba.the smokey sweet natural flavor is simply amazing! unadulterated because no water will seep into the saba. Wow, I learned something new today..
Saba and bagoong! This is my #1 favorite snack! Have you tried putting sliced up biasong into the bagoong sawsawan MM? And if you had homemade bagoong…even better! My grandma made the best moli or hipon fish “ginamos” sinabado style. Yummm! Iam drooling as I write. Oh…And did you wash it down with ice-cold Coke MM? Whoa! Saba-n-bagoong, Saba-n-Mayo, in-in-n-out-out. Whatevs, You guys are a lot of fun! Wow! Saging and guinamos is a snack that goes way back into my childhood in CDO. As a daughter of two Genuine Ilocanos who was raised in a Bisaya environment, I must be the only one in the family who enjoys this snack. I also add a squeeze of calamansi to the spiced vinegar-guinamos-siling labuyo combo. I prefer my saging at room temperature. I find it allows the flavors to blend better. I’ve eaten saba with quesong puti, or queso de bola, or dipped in sugar, or sugar and salt, and also dipped into coco jam or something sweet like that. Never tried the bagoong though. Will definitely try that out. My youngest son loves the dip you made. In Cagayan Valley this mixture is mostly used with sour fruits. So with it, my son can easily consume one whole pomelo. I didn’t imagine it can do justice to saba as well. Grew up with boiled saba with ginamos (and optonal sili dip). Yum! Its the first time I heard saba in bagoong :) I normally just eat it plain. On another note, I hate myself for voting that I have never cooked anything from your blog – I thought the question was if I cooked anything with a palayok! Grrr, in reality I have cooked perhaps 5-7 recipes from MM and all turned out great! Unless you count saba that’s been cooked in savory dishes (pochero, etc), I’ve never dipped saba in anything that’s not sweet…and I’m quite certain I’ve never eaten saba with seafood, especially bagoong! In fact, the bagoong-suka-sili combo is new to me, too. How intriguing…must try that the next time there’s saba. Does it have to be that watery, brown, fish bagoong, or would the chunky, alamang bagoong work as well? It probably is a Bisaya thing… I’m Cebuana, and we eat boiled/grilled plantains with bagoong/ginamos like it’s the most natural thing in the world. When we moved to Manila, everyone else found it weird. That dip also works with boiled camote. Sonny sj: I think “in in” refers to …finish cooking much like when I grill chicken wings or fish on high heat, I place it in the oven to make “IN IN”….or finish it off in the oven…for the final phase…..OR NOT?! ?…so sorry! My kababata loves to spread peanut butter on boiled semi-ripe saba. Masarap din! I’ve dipped white bread, biscuits, our pratta and murtabak in bagoong and chili (no sugar in bagoong please) but have not tried saba nor camote. Wow, I thought I was the weird one. And I really love that palayok! I love boiled bananas. Your post brings back memories of this as merienda with the Cebuano version of bagoong–ginamus! In Cebu, I spent many a carefree summer afternoon eating this. Because the saba was boiled unripe, the bland-tasting and extemely starchy cooked product required something intense-tasting to punch up the taste, thus the ginamos (fermented dilis and its juice, no sili) or simple muscovado sugar for dipping. And yes, alilay (above), when saba was in abundance, we would also make nilupak — mashing the boiled banana using mortar and pestle, sprinkling brown sugar and grated coconut for added flavor, then shaping the resulting mass into balls. Back then, most homes had banana trees in their backyards and a bottle of ginamos was a Cebuano pantry mainstay, so cobbling together a humble (and healthy) snack like this cost next to nothing. YUM! This reminded me of my childhood days! This is a typical snacks in CEBU especially when we go to the beach during weekends or when we visit our lolos and lolas in the province… and still going to the beach (My lola’s place happens to be near the beach). It may be weird for others, but for the Cebuanos, I believe that this is one of the “comfort foods”. Hehe! I remember during college days, we live near the market. My friend and I would always buy saba and boil it. We also love banana que. boiled saba dipped in ginamus/suka/sili is a daily meryenda in our family. ginamus is the visayan bagoong isda. i think this is the best way to eat saba. I remember my Lola serving her apos a perfect treat on lazy summer afternoons with steaming boiled sab-a and fresh nilupak. We all sit around the wooden table enjoying the healthy “saging” snacks harvested from her backyard. Good times! An in-law gave us a homemade sauce which she labeled “Uyap”(Cebuano) and she said it’s used as a banana dip. It was delicious with grilled chicken and pork too. This combo is so new to me but hope to try this soon! My dad usually has boiled saba with brushed with butter. Is that odd? Hehe. para sa mga bisaya na katulad ko, boiled unripened saba and ginamos are always the top on the list on every outing at the beach. Yum,Yum,Yum!!! Love it we often have this as kids in the province but its usually with cardava bananas whick is abundant. Mow I only get to have this treat when my mom makes our own bagoong isda which looks paler because she uses the “nylon bolinao”.Love it with Suka sa Lubi(coconut sap) or Suka sa Nipa(from nipa sap. You’re meking me crave for it now MM! wow…i love saba, but never thought of pairing it with bagoong…a must try for sure…. I remember my cousins and I broiling semi-ripe saba just picked off of our grandparents’ backyard and dunking these into the ginamos/sili/suka concoction afterwards. This is one of life’s simple pleasures. If you happen to have a SABA, broiled it then whipped it with margarine and rolled it with sugar. Discover what’s the worsst in it,just kidding. A good one to try. Boiled green bananas with ginamos is really bisaya! When making nilupak, I don’t use the mortar and pestle anymore, cause it’s too much trouble and hassle. I just pulse everything in my Cuisinart Processor, cut up boiled bananas, sugar, grated coconut for a few seconds and presto….. nilupak na! Try it and you will never use the native implements anymore. This is how my cousins at Tanjay, Negros Oriental eat their sabas, less the vinegar. Just had kamote and bagoong with sukang iloko yesterday. My husband prepared it because I told him about the saba and bagoong. The kamote was sweet so it was a great contast with its dipping sauce. I was so delicious. Ate so much of it!Thanks for the idea MM! I like my boiled saba with bagoong, kalamansi and sili. The saba would even smell (smoky) better if you drain a bit of the water and let dry up once it’s cooked. It brings back good memories of our old kitchen where my friends and my family gather for an afternoon merienda. The lowly saba has so many fans. I love it in nilaga or guinatan. Or banana que. That’s a weird sauce combination…but worth trying. Am glad I found the way to make nilupak. I always wondered what and how it was done. Lemme try that. boiled bananas dipped in bagoong is the number one favorite snack in Dumaguete and Negros Oriental. everr. that is according to me. :=) walang katulad at walang katumbas! When I was still living in the province, boiled saaba would always be paired with guinamos and sinamak. 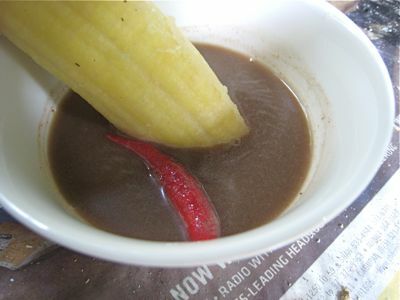 Wet guinamos with a few drops of sinamak and dip the boiled bananas in it. what a sumptouos treat for us kids. Sometimes, if half-ripe bananas would be plentiful, we would made it into linupak, then we would mold it into a triangular or circular shape and pretend that its our b-day cake. I missed eating these.